Epson Powerlite X36+ is the latest XGA (high-resolution video display) multimedia projector that comes with eye-catchy design and top-notch specifications. The latest model from Epson encompasses all latest technologies and features that every budget-friendly home theaters demand. 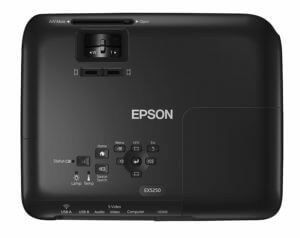 Here is a quick review on Epson Powerlite X36+ and comparison with Epson EX5250 Pro, the same brands earlier model at same price range and that sold like hot cake. Let’s explore how these two peers stand against each other in our Epson Powerlite X36+ Review. Powerlite X36+ sports 3600 ANSI lumens brightness 3LCD Projection technology with XGA native resolution (1024×768 pixel resolution). Its 3-Chip 3LCD brightness technology with 15,000:1 contrast ratio ensures vivid and 3-times brighter projection on the screen. The lamp life rated at 10,000 hours that lasts for 5-6 years on moderate use. The model has got ‘Instant Off’ system that saves power and cools down the lamp efficiently. Coming to connectivity options, the Epson Powerlite X36+ comes with HDMI input, S-Video, D-sub or computer, RCA, USB type A, USB Type B and Wireless interface (Wi-Fi standards IEEE 802.11b, IEEE 802.11g and IEEE 802.11n). The device quickly and easily pairs with smartphones and tables to stream media or presentations on bigger screen. Epson iPojectionTM application makes the life much easy to pair with Apple and Android smart devices and share the media files. The device is suitable for screen size up to 300 inches with best color details and sharpness. 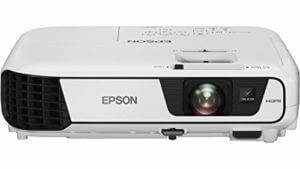 In comparison with Epson’s much successful model EX5250 Pro, the latest Epson Powerlite X36+ does not bring anything new to the specifications and features. Even the design and dimensions are exactly matching. We feel like the Powerlite X36+ is just a repacking with new model number, could be with slight performance tweaks and improvements. Overall, the latest Epson Powerlite X36+ has everything to impress the buyers and does not cost an arm and leg. Following the company’s success in EX5250 Pro, the same specification, features and price range is carried forward with marginal improvements on performance and user experience. For anyone looking to buy a good quality, branded multimedia projector at affordable price, EX5250 Pro is a right choice, so thus the latest Powerlite X36+.